When considering laser processing productivity, one aspect that needs to be addressed is how the beam is delivered to the workpiece. Scanning technologies are a big part of this and have largely developed alongside the lasers they work with. Indeed, as Georg Hofner, CEO of Scanlab, pointed out, some sectors, such as selective laser melting (SLM) and additive manufacturing owe their very existence to scanning technology. 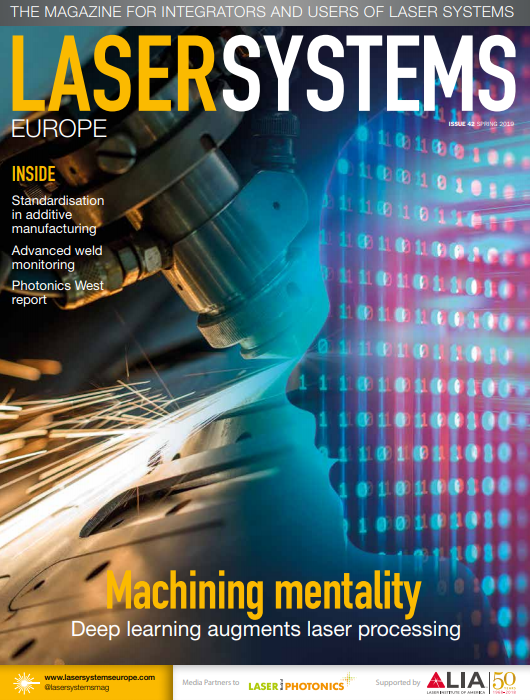 He added that the demand for scanning systems is driven by growth in laser processing markets. Sales of ultrashort pulse (USP) lasers for industrial processing have increased rapidly over recent years, because of the potential that comes with having pulse lengths in the range of around 10 picoseconds to 100 femtoseconds. With a high peak power intensity, fast repetition rate and broad spectrum, these lasers are ideally suited to applications where precision and cost-efficiency are paramount. Micromachining is one such application, as the lack of heat diffusion from USP lasers ensures there is no collateral damage to the surrounding surface. This and other attributes have led to demand for the technology in sectors ranging from automotive and electronics, to medical. Hofner commented that for years the industry has been filled with discussions surrounding the many different applications that could benefit from USP lasers, but that the talk often outweighed the reality. Now, he said, the situation is changing and the technology is becoming more prevalent. But the question for companies like Scanlab remains: how do you establish a fast scanning device that can really harness the potential of those lasers? ‘This question is why we always work closely with the industry to try to understand, as much as possible, the demands that they have,’ said Hofner. Hofner likens the challenge of developing a scanning device capable of keeping up with ultrashort pulsed lasers to that of designing a motorsport car. Scanning manufacturers need to be able to move the laser’s clearly defined focus spot very quickly, precisely and at a high dynamic. The laser power must be maintained and transferred down to the workpiece, but if the mirror were to have any imperfections, such as polarisation, the wavefront would be distorted. So, going back to the car metaphor, a racing car needs a stiff chassis so the vehicle doesn’t fly out of the corners, a powerful motor for acceleration, and strong brakes for deceleration, and all of these elements must be precise. Likewise, every aspect of the laser scanner’s properties, from the spindle and mirrors, to the high-precision position detecting system, needs to be handled correctly if the throughput is to be good enough to fulfil the user’s needs. Raylase, with headquarters in Wessling, Germany, understands this critical need for precision. The company develops deflection units, which comprise a galvo, mirrors, controlling unit and important electronic components, and these units are used to bring the laser spot directly to where users need it to be. Raylase products can work with a spot size of around 60µm in a field of 1 x 1m, and at a speed of more than 10m/s. According to Dr Philipp Schön, CSO at Raylase, other technologies, such as micro-electro-mechanical systems (MEMS), have some benefits, but today they cannot reach the required standard for beam power and precision. The company is looking at this technology, but believes that scanning heads – which enable the laser’s power to be focused and harnessed down to very specific points – will continue to be one of the most important elements for many applications, for at least the next 10 to 20 years. Scanlab has developed its ExcelliScan system, which uses digital encoders and innovative servo technology. The new servo technique more fully exploits scanner dynamics, thus boosting throughput while maintaining maximum linearity and long-term stability – even in constant operation. Another solution approach is to link individual galvanometer axes into more highly integrated systems. ‘And the manufacturing industry is also making contributions – for example, by deploying novel materials,’ commented Hofner. The lenses consist of a container that is filled with an optical fluid and sealed off with an elastic polymer membrane. The deflection of the lens is proportional to the pressure in the fluid. For laser processing, the company developed its EL-10-42-OF lens module with a 10mm clear aperture and integrated optical feedback. It is optimised for 532nm and 1,064nm laser wavelengths. The tunable lenses have an electromagnetic actuator used to exert pressure on the container. Hence, the focal distance of the lens is controlled by the current flowing through the coil of the actuator. So far, bulky motorised solutions are used to shift the laser spot in z-direction and hence enable 3D laser processing. In a complementary approach without mechanically moving parts, Optotune’s EL-10-42-OF can be integrated directly into an existing system. As Stadler observed, there is a clear trend within the industry towards more flexible, compact and less power-consuming systems. Tunable lenses also have a very broad range of applications. In general they are beneficial when precise and fast focusing at different working distances is required. This is relevant for machine vision applications, microscopy or for laser processing where a laser has to be focused on the workpiece. 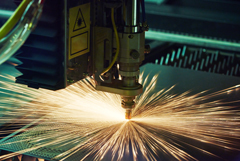 Like many others, the company is also looking to expand its efforts in the sector of micromachining where the challenge is controlling the laser spot precisely – a challenge that continues to grow as laser power increases. Good processing head design is essential to reduce focal shift, a phenomenon caused by the absorption of energy into the focusing lens. As the lens increases in temperature, its index of refraction and radius of curvature changes or distorts and the focus position shifts towards the lens with a different spot size (also described as thermal lensing). All optics absorb some energy from the laser. The absorption of energy into the lens can increase if the lens material and coating are inadequately rated for the amount of laser power directed onto them, but drastically increases if there are contaminants on the lens. This is a self-perpetuating process whereby debris on the lens causes a focal shift, creating a bad weld condition that creates even more debris and more focal shift. Most laser processing heads use a transmissive focus, where the beam passes through a lens to achieve focus. An alternative is to use a mirror, typically a parabola machined from copper, which focuses the beam as it reflects it. Reflective parabolic mirrors have long been used in high-power CO2 applications because they are more robust, less susceptible to damage and debris, and easier to clean than a transmissive lens, but they also do not exhibit thermal lensing and have virtually no focus shift. Polished, uncoated copper can provide excellent results, but enhanced coatings can give reflectivity of more than 99 per cent for the 1µm wavelength of fibre lasers. Eliminating focal shift through the use of reflective optics provides stability in laser welding processing heads, but there remains the one issue that plagues all welding applications – the debris that is generated by the process. It has been observed that the 1µm wavelength is far more susceptible to, and far less forgiving of, any debris either on the optical elements or even in the free space air in the beam path. Keeping the optics clean and protected is essential. Visual inspection is not completely adequate as it has been found that contamination can exist on a sub-micron level, invisible to the naked eye, but still of influence to the laser beam. Frequent inspection by microscope, combined with routine cleaning and replacement of optics, must be a formal procedure. There are a variety of additional methods for protecting optics – such as cross-flow air knives, purge chambers and reduced apertures – that have been successfully implemented. Airborne debris in the beam path can also cause scatter of the 1µm beam, so the machine design of a laser welding system should incorporate effective fume removal of the welding zone and in some cases, the placement of additional air knives close to the process.